Top: Greg’s short video of our experiences. Above: Photo from Day 4 as refugees from the Camp Fire . We are so hardwired to early walks that we have been simply strapping on our regulation masks that help protect from all the ash in the air and go out walking for an hour or two in beautiful Bidwell Park in Chico. Our car and clothes are dusted with ash, even though you can’t see it in the photo. It looks like even if the fires and roads clear up, our home, if still standing, the water and power and all infrastructure that are either non functioning or contaminated from ash mean it may be two to three months before livable. And even then, the town is, well, gone. It may rev up relocation quest. What they say about not ever knowing what the next day – or moment – may bring is absolutely true. Just about one week ago, on Thursday November 8, my husband Greg and I stepped out on our usual morning walk to Paradise Lake, about a fifteen minute stroll behind our property. It was about 6:30 a.m. We could see a huge billow of black clouds several miles to the east, with the sun peeking out from its edges. I gasped, knowing from previous experience that this is what wildfire clouds can look like. Yet the rest of the sky was an immaculate blue and there wasn’t a whiff of smoke in the air. As we made our way through the California Conservation Corps Fire Center near the lake, we asked about it and were told yes, it was a fire started in Pulga to the east by power lines. The wind was kicking up, and we went home to stay on alert. A couple of hours later, the power went out. The electric company had notified us previously that in fire danger conditions, they may well preemptively stop power for community safety. Still, clear blue skies prevailed, so we went about our day. With no access to internet or TV, were moved through the day oblivious to the conflagration that was taking place in the town of Paradise several miles to our south. Cell service stopped, so no access to details that way, either. Late afternoon, we decided to take a reconnaissance drive south. It was four miles down the road that we encountered the fire having burned southwest. Still no smell of smoke. And skies in Magalia clear. The car radio was on, but there was no word of evacuations, just talks of warnings to be ready in the event the fire traveled north. We turned back to home, and fired up our car engine with plugin adapter so that we could catch news on TV. With evacuations to the south, and the warning to ‘be ready’, we packed two cars with clothing, some valuables and important papers, ready to go should hard news hit. We never did get the ‘mandatory evacuation’ for our zone, and with no smoke in the air, we turned in late to get some rest. I couldn’t sleep though, and finally about 3:00 in the morning when we could hear propane tanks exploding in the distance, we stepped outside to a sheet of falling ash and decided, now’s the time. We could get no information on the radio about which direction to head. The primary road out is south through Paradise, and earlier we had heard to be prepared to travel north towards the mountains in a long evacuation route. Not knowing the current status, we headed south through the dark, and about 3 miles down the road encountered burning buildings and flames blowing across the road. We searched for fire staff, or sheriff, for direction. But there was no one there. Which told us that resources were being spread so thin that we needed to make a decision for ourselves. We did an about face and headed north, through long winding roads until encountering the sheriff forces who told us to continue, turn left at the stop sign at Butte Meadows, and just keep going until we hit Chico. Luckily one of our cars was filled with gas – but all the gas stations in the area had stopped pumping with the power outtage earlier that day. We thought we were going to have to leave one of our cars abandoned by the road, out of gas – like dozens of other vehicles we saw along the way through the eerie morning darkness. But to our good fortune, there was one person with a gas tank pumping gas in Butte Meadows for people like us who needed a little fuel. We fueled up and arrived in Chico at about 6:00 on Friday morning. The town was enveloped in smoke. Emergency vehicles were gathering and being dispatched. Coffee shops were closed. We started texting cousins who knew other cousins in the area where we might at least find some respite from the morning’s turn of events. Even though we had not seen many of our Chico cousins in many moons, they scrambled to give us shelter and safety. The comfort and kindness they have been giving to us ever since – now so many days later – is astonishingly wonderful. We haven’t any idea of how long this saga will continue. 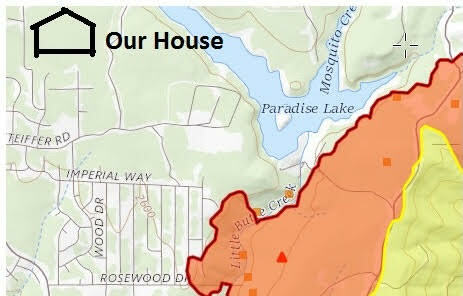 At this point it appears our home has escaped the flames of destruction – though smoke damage yet to be assessed. And the entire community is devoid of services. Power, water, communications, markets. As my friend Miyoko was observing during our phone conversation earlier today, the fallout from this fire is not unlike Pompeii. From vibrant nature to ash. Thousands of fire fighters, rescue personnel, and law enforcement have been multiplying on the scene. As of this writing, the first still rages, though containment grows. We watch for word while trying to manage our affairs without knowing much about outcomes. We contacted our insurance agency and they are assisting with the costs of displacement. 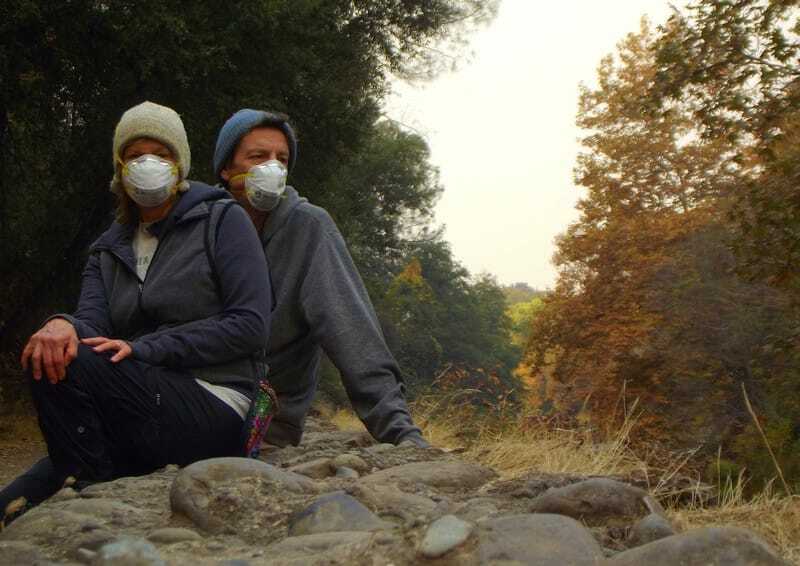 We walk with our masks on and the rest of the day spend as little time dashing between shelters to escape the toxicity of the air – which, as a nurse friend pointed out, is heavy with not only ash and wood smoke but chemicals and burning tires and gas fumes and everything else that combusts in these conflagrations. We continue to be grateful to our dear cousins. I have been pitching in with making salads and stir fries for dinner, serving some treats from Miyoko’s Kitchen (omnivores universally love this stuff!) and vegan ice cream. We are so much more fortunate than others. For example, yesterday we were in line at the bank to make a transaction, along with several other people in N95 masks (named thus because they filter out 95% of the toxic particulate in the air), and asked the woman in front of me how she was doing. She told us that she had lost her home, her two dogs, her car, that her husband had lost his job because his place of work had burned down, and that he had suffered a heart attack during the evacuation. Heavens. The human suffering is unimaginable. Thank you also, those who have written, called, posted messages to me, or reached out in a gazillion other ways to show your love and support. We have had people we have never met invite us to take refuge in their homes from more than a dozen states across the country. I have received messages from people asking if they could have our address so they could send us gifts, care packages, kitchen appliances – anything that make our journey through this easier. So we have got it good – safety, shelter, and many kind hearts to buoy our spirits as we navigate these uncertain times. Thank you Tessa, your thoughts mean so much. I have been wondering how you were doing. I am so sorry for everyone affected. I am sending love and light and prayers for a smooth path ahead. Sarah, thank you! Very much appreciated. I’m really thinking of you and all who are suffering during this tragedy. You and your family and community of humans and animals are in our thoughts constantly. Be well and never hesitate to reach out-everyone is anxious to help. Love always. Allison, thank you so much for your generosity. Our thoughts are with you. So much gratitude for the kindness of others and the work of the first responders. Timaree, thank you so much! 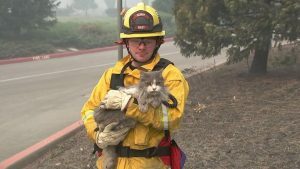 And yes, the first responders….so much gratitude as they put their lives on the line to help others. Karen, you are right – this unfolded in an entirely unexpected way. That is probably how it usually happens. Fire, winds, nature…there is an unorchestrated chaotic scene that can unfold that demands we keep our senses and be present as much as possible, to discern the best response in the moment. Turns out practice of presence delivers even in these situations. I appreciate you sharing your thoughts today. Thank you so much for posting, Lani. Glad you are safe😊. So sad to hear what you’ve gone through😢🙏. Stay well. 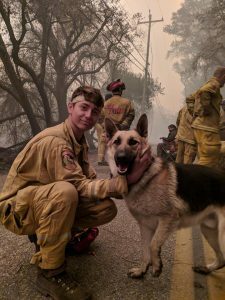 Thanks for sharing so that we can understand the wildfires on a personal level. Stay safe & we are praying for you. Rebecca, I appreciate your thoughts! Thanks. Agree with Rebecca. Just adding love and support from across the pond (Estonia), Lani. I have been meaning to write you to thank you for your “Fuel yourself well and on time!” comment (a good constant reminder which has helped me a lot), and now I see it in a whole new light – for you! I am sure you are returning compassion for compassion. It is your way. Stay safe, stay positive. Peg, thank you for your thoughts from across the continents. I appreciate the personal touch and connection in your message, and it means the world to me if anything I have said or done has made a difference for the better in someone’s life. I appreciate. Susan, thanks! And the reason our one car had a tank of fuel is an entirely other story. It was only so due to the kindness of a friend hours earlier in the day, as when I went to get gas late morning, the stations were already closed. If my friend had not delivered, we would have not had the story of escape we have now. Yes, keep some gas in the car. New rule. Thank you Kathe and John! You know, I have been anxious about firestorm for years. The amount of trees and wood that would need to be cleared to make things safe is unimaginable. I have grown increasingly uncomfortable living in those conditions, and even if our house still standing, I don’t think I can live in such conditions again after our experience. Everything is unpredictable in these circumstances. Best laid plans and assumptions can go out the window. It’s a tender time. Thanks to you for coming in to share, and offer refuge! What a relief that you and your husband are alright! I am so thankful you have the open arms of family and strangers to support and care for you, and you for them. A tough road is ahead, but I hope your home is protected, and you will be able to return soon. Praying for strength and health and safety for everyone affected. Thank you Tanya for your kind thoughts! Oh Lani, this is just breaking my heart. I am so so sorry for all you and your whole area is going through. So grateful you are ok and that you have your mindfulness practice to keep you sane during this crazy time. Sending love your way. Thank you so much my friend! And yes, the practice is unbelievable support. For a few months before this, I had made a concerted effort to strengthen my practice. Little did I know what I was preparing myself for! Oh Lani, how terrifying, my heart goes out to you and hoping for the best possible outcome for you! I’m sure you have been really utilizing your mindfulness training to stay sane during all of this. We get a lot of wildfires fires here in S FL too, a few were far too close to home so I can only imagine how scared displaced you felt and really empathize with how disorienting the experience must be. The thing that I find mystifying though, is here after a fire the greenery and trees are incinerated…. and occasionally houses, but there in so many of the pictures I’ve seen, the greenery seems little affected but the houses are decimated? Strange. Blessings to you and yours, keep us updated. Thank you Veggie Tater! Your thoughts and words mean so much and I appreciate every one of them. I’m so shocked to hear your story and so grateful you are safe! It’s so wonderful that you have a supportive family to help you through these terrible times. I’m thinking of you and your whole community. I wish you peace and comfort. Hi Karin! Thank you so much for your wonderful sentiments! You have been in my thoughts & prayers.Thank you so much for the update! Thank you so much Webra! What a huge ordeal you have been through….. as the California smoke has made it’s way to Oregon, it reminds me of how many are suffering the devastation of the fires… I am on FB with several who have lost everything. I am thankful that you are alright, have a place to stay, and praying for your community. Blessings to you!! Jennifer, indeed the span of those who lost to those who lost less is broad. We are ever grateful each moment for everyone who has stepped in to help those in need and have made this journey safer to this point for us than it would be without their assist. Thanks for sharing your thoughts. Thanks for this updated blog and video. What wonderful cousins. Stay safe! We are praying for residents of Paradise during this awful, trying time. My husbands youngest brother Gary & wife Betty managed to escape with just their vehicles & few documents. He lost his psychologist office in Paradise, their church, hospital, school etc & friends are scattered. we hurt along with all these dear people who are displaced & lost so much.